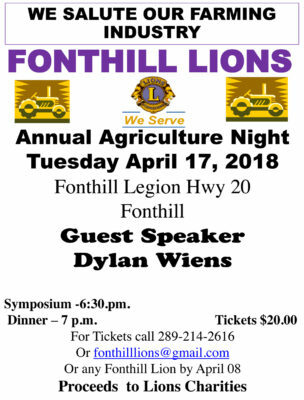 Join us for our 73rd Annual Fonthill Lions Agriculture Night, Tuesday April 17th 7pm at the Fonthilll Legion. Guest Speaker for the evening is Dylan Wiens, a third-generation tender fruit farmer in Niagara On the Lake and Operations Manager at Kai Wiens Family Farm, a 160 acre farm specializing in peaches. Wiens and his wife Sara have three children, Oliver, Sophie and Molly. He attended Western University for Music and Ethics, Niagara College for International Commerce, and the Rural Ontario Institute for Advanced Agricultural Leadership. Their modern family run farm focuses on integration and efficiency. 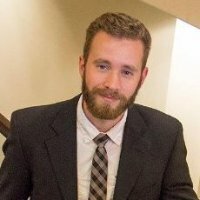 Through the Advanced Agricultural Leadership Program (AALP) Dylan had the opportunity to improve his leadership abilities and study agriculture across Ontario, the Eastern United States, Vietnam and Thailand. Across all these experiences Wiens noticed common themes family farming with many of the same strengths and weaknesses occurring in every nation. The Fonthill Lions invite the public to attend our annual salute to Niagara’s local farming industry. We have been hosting our Agriculture Night annually since 1945 and is one of Pelham’s longest running community events. Tickets: $20.00 per person For Tickets call 289-214-2616 fonthilllions@gmail.com or any Fonthill Lion by April 8th. The curriculum includes a series of eight seminars, two study tours – one North American and one international – and one issues analysis project. Study topics include government and political systems, marketing and economics, environmental impact, national and international trade, communication and organization skills, decision making, consumer and social issues, media relations, agri-food trends and society and globalization and the dynamics of change. AALP was established in 1984 through the work of four partners – the University of Guelph, Ontario Federation of Agriculture, Ontario Ministry of Agriculture, Food and Rural Affairs and Foundation for Rural Living.